International singer and Scientology advocate David Pomeranz recently visited the Dangerous Drugs Board to receive the Plaque of Recognition on behalf of the founder of various drug education and rehabilitation techniques, L. Ron Hubbard. Sec. Anselmo S. Avenido Jr., DDB Chairman, and Asec. Ma. 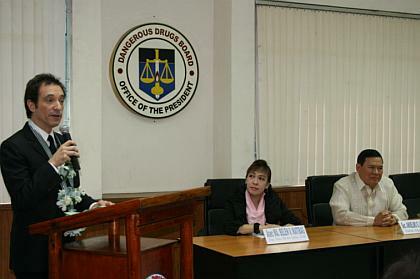 Belen V. Matibag, Deputy Executive Director for Operations, lead the ceremonies at the DDB Conference Room, 12 February 2008.